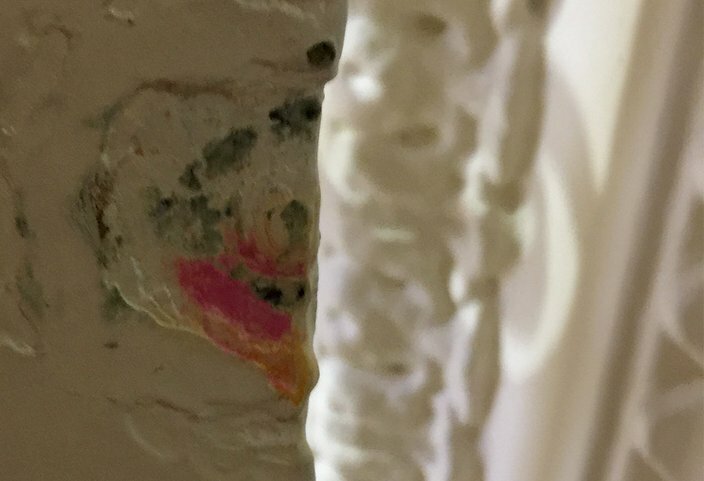 Paint chipping in the County Board of Elections Office in Room 142 at City Hall tested positive for lead exposure, as indicated by the pink color. 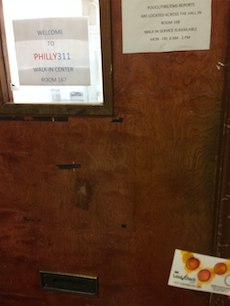 PhillyVoice tested seven locations in City Hall this week and every one tested positive. 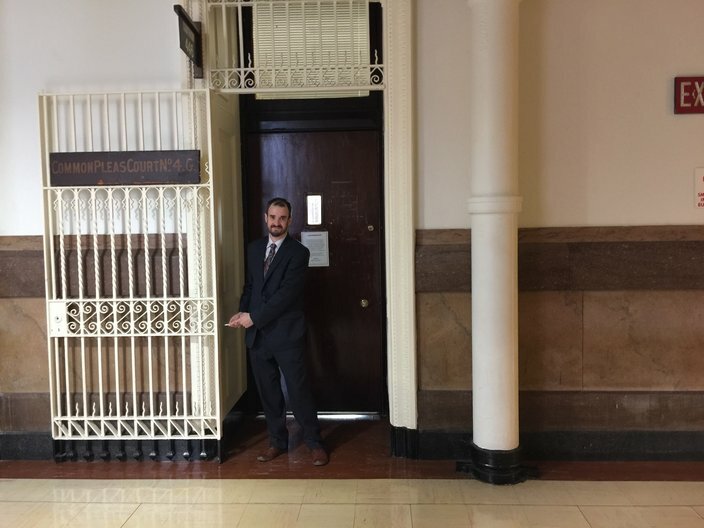 Several months into his family’s legal battle with Philadelphia’s Lead and Healthy Homes Program, a frustrated Jason MacDonald decided to test the entryway to a City Hall courtroom for lead exposure. As he expected, the 3M Lead Check swab results turned up what was – according to the testing-kit instructions – a “hazardous level of lead." By that point, he and his wife Emmalee knew what they were talking about. After their two-year-old son tested positive for lead poisoning, the family experienced the ups and many downs of interactions with a city program that aims to help make homes safer for young children. Despite moving out and working diligently to remediate the issues on their own, they were taken to court by a city that apparently didn't accept they were doing the right things in a timely manner. 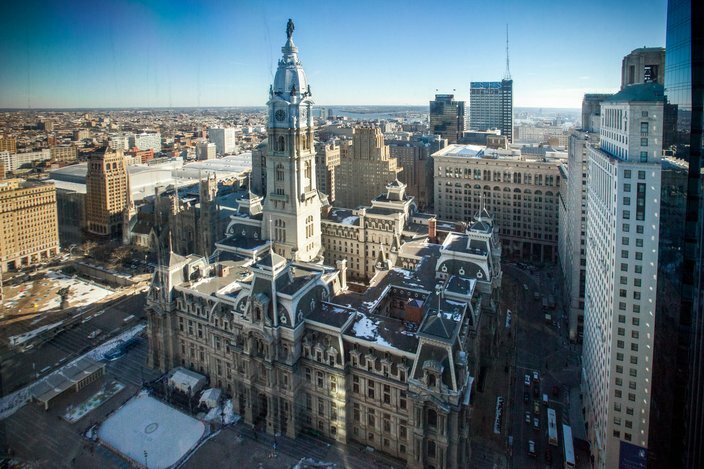 After covering his family’s plight for the past several months, PhillyVoice decided to follow suit and take a testing kit over to City Hall to test several public areas for lead-paint exposure, which is a widespread issue across Philadelphia. Armed with eight Instant Lead Test swabs on Monday, we again checked the area near Courtroom 446, where the MacDonalds fought the civil complaint filed against them by the city. It still tested positive. • The doorways to the office of City Councilwomen Cindy Bass and Blondell Reynolds Brown (chosen for testing because Bass is the MacDonalds' representative on council and Reynolds Brown’s staff helped the family navigate the lead-program bureaucracy). Each and every one of those areas tested positive for lead: Seven for seven. The eighth swab was destined for Mayor Jim Kenney’s office, but our request to test there was declined. Jason MacDonald outside the city's Lead Court on the fourth floor of Philadelphia City Hall. "The first time I went to court, I said that this courtroom is in way worse shape than our house ever was, so I brought the lead tests the next time which, of course, were positive," Jason MacDonald said. "Literally every city of Philadelphia lead inspector and health department worker that they bring in to testify against people walk in and see that. "So, the courtroom they're prosecuting these cases in is violating the city's own statute." For its part, the city didn't seem all that concerned with our findings, saying that lead in a public building isn't as concerning as lead in homes where young children live. The city's response is fair – to a point, said Donna Cooper, executive director of the Public Citizens for Children and Youth (PCCY), a group which advocates for "quality health care, child care, public education and family stability." The results would be more concerning if "little children were crawling around City Hall, but the odds of a 6-year-old eating paint chips there are slim to none." She noted that Wednesday's PhillyVoice story about the MacDonalds' plight did concern her, since the city's lead program dedicated a lot of resources to battling the family when they could be doing more to crack down on real slumlords. Dr. Jay Schneider of Thomas Jefferson University, who researches the effects of lead on children, said more than City Hall, his primary concern is "old school buildings where kids spend lots of time." Upon hearing of our lead-test results, he agreed the risk is minimal, but added: "I also think the situation should not be completely ignored." "What if a small child is in City Hall, and, as children will do, decides to walk down the hall running his or her hands along the walls and they happen to be walls with exposed lead and then that child puts his or her hands in their mouth, again as children do?" he asked. "Then what? Well, there is a good possibility that child just ingested lead. How much lead is impossible to tell at this point." "What you found is not a rare exception. I just don't know to what extent this might be a problem. ... I don't think City Hall is a danger to visitors, but since there is no safe level of lead in a child's body, why not err on the side of caution?" 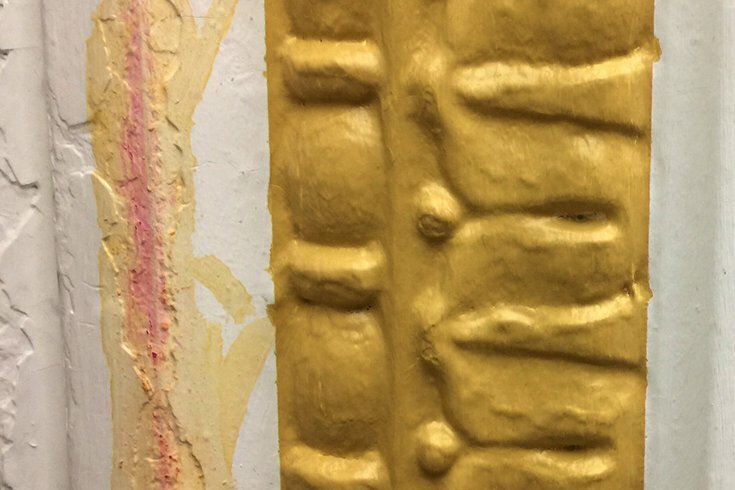 The door jamb area outside the city's Lead Court tested positive for lead. City officials weren't very concerned. Any renovations at City Hall should include lead remediation with a licensed lead abatement contractor, he said. And if there are more areas with lead-exposed surfaces, signs should be posted about a potential lead hazard cautioning parents not to let their children touch the walls or window sills. Schneider also advised that adults and children at City Hall alike should be encouraged to wash their hands if they do touch such painted surfaces. Have there been lead remediation efforts at City Hall in the past? The Department of Public Property has done multiple lead remediation projects in City Hall. As with just about every building built before 1978 (when the federal government banned lead paint), it is expected that there is lead paint inside. This includes the vast majority of houses in Philadelphia. What are the risks involved in that? Lead paint is only dangerous if it is exposed through chipping or peeling, or is ground into dust, and someone ingests it. The best way to minimize the risk of lead exposure from paint is to maintain all painted surfaces in good condition so that none of the older lead-containing paint is exposed. Remediating or removing lead paint can be tricky. If not performed correctly, there is a risk that the removal process can generate and disperse more dust. If you have any question about best management for chipping/peeling paint, always consult with a qualified contractor. It is unlikely that anyone would be eating or otherwise ingesting paint chips, as that behavior is usually only done by children under the age of six, so the danger in that building is very low. If any dust-generating activities like renovation or repair take place, remediation using a licensed lead abatement contractor is done to ensure the safety of employees and visitors. In all other cases, the Health Department recommends that all children be tested for lead exposure at age 1 and again at age 2. If a child’s blood lead level is elevated, the Health Department is notified, and we contact the family to offer assistance and advice on how to reduce the child’s risk. The area outside the 311 Walk-In Center on the first floor of City Hall tested positive for lead. It’s not unusual to find lead paint in older cities like Philadelphia so if people test their homes; it is likely they will find it. The more important question: Is the lead paint dangerous, meaning is it chipping, peeling, or being ground into dust. If it is, then the painted surfaces should be repaired and, possibly, remediated by a licensed lead abatement contractor. How is this different than testing a home? It is important to distinguish the significance of detecting lead paint in a home with a child who is already lead-poisoned from a home where no children reside. In a home with a child who has already been exposed to lead, we would aggressively look for the specific locations of concern and perform lead remediation work. On the other hand, in a home with no resident children, the presence of lead is far less significant. Our recommendation would be to simply maintain all painted surfaces in good condition, usually with a good paint job. What advice do you have for people concerned about lead dangers at home? If people want to know if their home has lead paint and if they should call a licensed lead abatement contractor, the Health Department maintains a list of licensed inspectors/risk assessors, updated monthly, on this page (under List of Certified/Licensed Lead Professionals). If people need to remediate, the Health Department maintains a list of certified lead abatement contractors in Philadelphia, on this page (under List of Certified Lead Abatement Contractors). Landlords and tenants have a special relationship and the Health Department maintains a detailed webpage listing all of the responsibilities that landlords and tenants have to make sure that children are safe from exposure to lead paint.